The Congress today defeated the BJP and retained its hold over the 24-member prestigious Shimla Municipal Corporation (SMC) with a two-thirds majority by winning 16 seats. With this, the Congress has maintained its hold over the SMC, ever since its formation for the fourth time, shattering the hope of the BJP to capture the civic body. The humiliating defeat of the BJP in the Shimla Municipal Corporation poll has put a spoke in the party's victory march. The party, on a winning spree ever since Mr P.K. Dhumal took over as Chief Minister four years ago, has tasted defeat at the hustings for the first time. A former minister and Congress leader Pandit Vidyadhar died at Indira Gandhi Medical College and Hospital, Shimla, yesterday. He was cremated at his native village Bagori (Kiani), about 15 km from here today with full state honours. He was 86 and is survived by his wife, two sons and two daughters. The Him Loktantrik Morcha has alleged that officers of the state electricity board in connivance with the state government are manipulating the criteria for allotment of hydel power projects to keep the Indian companies out of race. A five-member gang of burglars decamped with nearly Rs 80,000 cash after breaking into Bajjreshwari temple due to a security lapse here last night, the police said here today. The authorities’ failure to ascertain the cause of the fire that destroyed a cluster of nearly 40 shops near Gandhi Chowk here on the night of April 25 has come under fire from all sides. Within an hour, the shops were burnt to the ground, causing a loss of about Rs 2 crore. The Tibetan Youth Congress (TYC) today installed the statue of Thupten Ngodup, who committed self immolation during a hunger strike in Delhi, at the main temple in Mcleodganj. The BJP got six seats, while the recently formed Him-Loktantrik Morcha of Mr Mohinder Singh secured one seat. A rebel of the Congress, Mr Harish Janartha, defeated the official candidate of the party in the Sanjauli area. The biggest setback was suffered by Mr Sukh Ram whose Himachal Vikas Congress failed to open its account. The HVC had chosen to contest the election separately, although it is in the government in alliance with the BJP. Among the prominent losers was Mrs Jenny Prem, Mayor of the SMC, who lost to Mrs Swarana Devi of the BJP in a direct contest in the Comli Bank ward which was reserved for women. The Congress had last time won 22 seats, while the BJP had two members. Addressing mediapersons jointly, the PCC chief, Mrs Vidya Stokes, the CLP leader, Mr Virbhadra Singh, and a former Chief Minister, Thakur Ram Lal, described the victory of the Congress as a referendum against the BJP government and endorsement of the policies and programmes of the AICC chief, Mrs Sonia Gandhi. Mr Virbhadra Singh demanded that in view of the electoral outcome, the Chief Minister, Mr P.K. Dhumal, should resign as the SMC poll was an indicator of things to come in the Assembly elections. On the other hand in a statement, Mr Dhumal said that the BJP has made a marked improvement in the SMC and its strength had gone up to six from two. Jubilant Congress activists, danced to the tune of traditional Himachali musical instruments on the streets as the results started coming in their favour. They thronged the PCC headquarters on The Mall and also marched to the “Holy Lodge”, the residence of Mr Virbhadra Singh. The AICC secretary, Mr Satyajit Gaekwad, who was the AICC observer for the SMC elections and had managed to unite the two warring factions, said that the people here had voted for the policies of Mrs Sonia Gandhi and against the “misrule” of the BJP. Mrs Stokes, Mr Virbhadra Singh and Thakur Ram Lal told media persons that despite widespread rigging right from the prepration of electoral rolls when a large number of names were got deleted by the ruling party, the BJP failed to win the election. Mrs Stokes alleged that the government used unfair means and pressurised officials. She said that the Congress would have swept the polls if the rebels had not jumped in the fray. DHARAMSALA: Terming the outcome of the Shimla Municipal Corporation elections as the beginning of the end of the BJP rule in the State, former HPCC chief, Sat Mahajan said today that the people had voted against poor governance and corruption in Himachal. Addressing a press conference here today, Mr Mahajan, who had been appointed in charge of the MC elections said the people had given a clear verdict in favour of the Congress by giving two-thirds majority to the party. “Despite election gimmicks, including deletion of genuine voters and addition of fake votes, the BJP failed to stop the Congress wave in the entire country,” he stated. “The people are fed up with the poor governance, nepotism, corruption and lawlessness as Gujarat is burning and Himachal cracking under the BJP regime,” he observed. He alleged that despite ministers personally sitting at the polling booths and Muslim voters prevented from casting their vote, the people had preferred the Congress. Mr Mahajan, said that Shimla being the capital of the state, reflected the mood of the electorate as a large number of intellectuals, bureaucrats, businessmen and government employees resided there. He said that with the results of the Shimla MC, the writing on the wall was clear as the BJP would meet the same fate in the Assembly elections. HAMIRPUR: Mr O.P. Rattan, spokesman of the Congress, said that it was a result against the anti-people and anti-employees policies of the state government and proved that people were all set to bring Congress party to power in state. Talking to reporters here, he said the results proved that democracy had won against dictatorial forces. The ruling BJP suffered a setback as its candidate Neelam Sharma failed to win the election to the Shimla Municipal Corporation (SMC) in the VIP ward of Benmore where the official residences of the Chief Minister and most of his ministerial colleagues are located. The Congress candidate, Mrs Maya Kataria, won the seat by securing 900 votes against 581 of Mrs Sharma. The Congress candidates who won are Mr Jeetendera (Bharari), Mr Devender Chauhan (Kalibari), Mr N.K. Mehta (Kaithu), Mr Shashi Shekhar (Phagli), Mr Sohan Lal (Krishnanagar), Ms Maya Kataria (Benmore), Ms Anita Tej (Khelini), Ms Sangeeta Sharma (Chhota Shimla-1), Ms Nisha Gupta (Chhota Shimla-2), Mrs Mala Singh (Jakhoo), Mr Harish Kumar (Boiluganj), Mr Anand Kaushal (Tutikandi), Mrs Richa Sharma (Sanjauli-1), Mr Sudhir Azad (Sanjauli-2), Mr Ashok Sood (The Mall) and Mrs Archna Dhawan (Lakkar Bazaar). The BJP candidate, who won are Mrs Saroj Thakur (Shankli), Mr Devinder Mista (Nabha House), Mr Sanjeev Sharma (Ram Bazaar), Mr Digvijay Chauhan (Kanlog), Mrs Swarna Devi (Comli Bank) and Mr Anil Kaushal (Sabzi Mandi). The Congress rebel, Mr Harish Janartha, secured 499 votes against 231 votes of the official candidate of the party in the Engine Ghar ward of Sanjauli. Mr Rajeev Thakur of the newly formed Him Loktantrik Morcha of nine parties led by Mr Mohinder Singh, former Public Works Minister, won the election in the Summer Hill ward by securing 805 votes against 605 of Mr Sanjeev Thakur (Cong). The humiliating defeat of the BJP in the Shimla Municipal Corporation poll has put a spoke in the party's victory march. The party, on a winning spree ever since Mr P.K. Dhumal took over as Chief Minister four years ago, has tasted defeat at the hustings for the first time. Victory has eluded the BJP when it needed it most to lift the morale of its cadres which had plunged to abysmal depths following the party's poor showing in the Assembly elections in the neighbouring Punjab, Uttranchal and other states. A good showing in the Municipal Corporation poll would have improved the party's prospects in the Assembly elections which is less than a year away. The poll outcome may or may not have a bearing on the Assembly elections but it does reflect the mood of the voter which has overwhelmingly rejected the ruling party. Worse, the party was relegated to the third position in some of the seats and barring one, its victory margin was very thin. This was all the more shocking for the party as it had made the election a prestige issue and its leaders had spared no effort to ensure victory. The ministers went door to door and being the party in power used all tricks and gimmicks to oust the well-entrenched Congress. The party could well claim that it has increased its strength in the House from one to six, but the sharp fall in its overall percentage tells the real story. The party has much to think about why it lost the election in the face of a hopelessly divided opposition and having offered all kinds of sops to all sections of the electorate, particularly employees. It is quite obvious that sops and populist measures are no substitute for "good governance'. On the other hand, securing 16 out of the total 24 seats was no mean achievement for the Congress which has been ruling the corporation for the past over 16 years. The party stood vertically divided after the allotment of the party ticket and official candidates faced a strong challenge from rebels in over a dozen seats. Yet the party managed a two-thirds majority and only one rebel could make it to the winning post. The result has come as a shot in the arm for Mrs Vidya Stokes, PCC chief, as it is the first time that the party has won an election after she took over the reins of the party. The victory will silence her critics and go a long way in boosting the morale of the cadres. It will also have a sobering effect on rebels. While the eight-party Him Loktantrik Morcha managed to secure a solitary seat, the Himachal Vikas Congress ended up among the "also ran". Obviously, the presence of a large number of candidates in the field and the infighting in the Congress did not influence the electorate who had made up their minds to teach a lesson to the BJP. Mr Rahul Anand, Deputy Commissioner and Mr S.R. Ojha, SP, Chamba, laid wreathes on the body of Vidyadhar on behalf of the Himachal Governor, Mr Suraj Bhan, and the Chief Minister, Mr Prem Kumar Dhumal, respectively. The Industries Minister, Mr Kishori Lal, and the Minister of State for Ayurveda, Mr Mohan Lal also mourned the demise of the veteran leader. 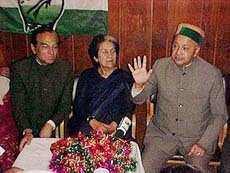 Meanwhile, a former Chief Minister, Mr Virbhadra Singh and the Himachal Pradesh Congress Committee President, Mrs Vidya Stokes, in their condolence messages described the death of Vidyadhar as a great loss to the party. Mr Mohinder Singh, convener of the morcha, said the government allotted eight projects in 2000 and in July, 2001, bids were invited for a project on the basis of the criteria adopted in 2000. However, now the criteria had been altered to enable the government to favour select parties like Malana Power Company, Lnco Group and Jindal Power and Cosmos Consulting. These companies did not qualify on the basis of the marks awarded hence the marks were being ignored by the high-powered committee in shortlisting the companies. Even foreign companies have been making efforts to get projects. In 2000, out of 8 projects, 5 were allotted to foreign companies but as these companies did not achieve the required progress their MOUs were cancelled. One project was given to HPSEB for development. However, the state government had restored the MOU’s of 4 projects in favour of the same foreign companies. He said if the Cabinet decided to assign these projects on changed criteria during its meeting tomorrow, the morcha would launch an agitation. Kangra district police chief Sanjay Kundu today said a member of the gang entered the temple premises before temple was closed at 9.30 p.m. last night and hid himself in a room. He said the others joined him when he opened one of the doors of the complex. The two persons on security duty had fallen asleep when the burglars were looting, disclosed Mr Kundu. The burglars broke four steel almirahs in the office of temple officer and decamped with Rs 80,037 cash which included Rs 25,035 old currency notes. The temple management came to know about the incident at 4.30 in the morning and informed the authorities. The Deputy Commissioner, Mr Parbodh Sexena, and the SSP Mr Kundu reached the temple at 6 a.m.
Mr Kundu said the theft took place because of the inadequate security at the temple. The police pressed into service a dog squad, took finger and foot prints and forensic experts visited the temple for investigation today, the SSP disclosed. Mr Ram Prasad Sharma, trustee of the temple and member of the HP Temple Management Committee, told this correspondent that he had informed the Deputy Commissioner and SDM, Kangra, that security needed to be stepped up at the temple in view of the gold, silver and cash worth more than Rs 1 crore in the temple. Another member said that administrative lapse was responsible for the security lapse in the temple. Mr Sharma said that the close-circuit TV set up in the temple was out of order for the past six months. Mr Kundu said that had this circuit been operational it would have been easy to nab the culprits immediately. There was nearly 15 kg of gold in the temple when the burglars struck. While a magisterial inquiry ordered by the District Magistrate of Chamba, Mr Rahul Anand, into the fire incident, a question mark hangs over the earlier inquiries into such incidents, which occurred at other places, including Chamba town, as they have not resulted in any administrative measures for preventing such major fires. The inquiries, it appears, have not critically examined the facts behind these incidents and have never suggested remedies and improvements in the system. This has given the impression that these inquiries have merely been an eyewash. Local residents say that the executive magistrates, who are local administrators, should be impartial in identifying lapses. Most commonly, it has been observed, the inquiries conducted in these matters usually point the reasons of the fire without explaining how the loss could be minimised. Roughly built shops and haphazard constructions that have cropped up in the hill town are the main cause of fire. But it is due to the laxity of the local administration that the town is growing as a slum, even though it was designated ‘a special area’ under the Town and Country Planning Act some years ago. Access to the main bazaar is blocked by encroachments. Indiscriminate and thoughtless work leaves little space around buildings, resulting in a safety hazard during a natural calamity or a fire. Many hotels built without approval are springing up in and around the hill town under the administration’s nose. These ugly structures mar the beauty and charm of hills. Nothing has been planned in this hill resort famous for its salubrious climate and known as a sanatorium for tourists hailing from all over the globe. Addressing the youth, the Chairman of the Tibetan Parliament, Mr Pema Jugney, urged them to fight for the independence of Tibet. Unveiling the statue he said Thupten Ngodup had a special place in the heart of every Tibetan for making the supreme sacrifice. A former political prisoner of Tibet, Mr Kunchok Tendar, said the TYC hunger strike in New Delhi four years ago had been one of the most successful political activities during the exile of the Tibetan Government. He showed a letter that he brought from Tibet in support of the hunger strike. Tibetans, including monks, nuns, schoolchildren and officials of the Tibetan Government-in-exile, paid tributes to thousands of martyrs , who had given their lives for the Tibetan cause. The vice-president of the TYC, Mr Tenzin Samphel, said the Chinese authorities were arresting many people and the human rights situation was worsening day by day in Tibet. The TYC leaders including joint secretary Dolma Choephel, urged the international community to take concrete steps in resolving the Tibet issue. As many as five persons were killed and 11 injured, three of them seriously, when a private bus fell into a khud near Kufri, 18 km from here, today. The bus was on its way from Rekong Peo to Kangra. While four persons died on the spot, one succumbed to his injuries at Indira Gandhi Medical College, Hospital here. Driver Yoginder Singh of Kangra, was among those killed.